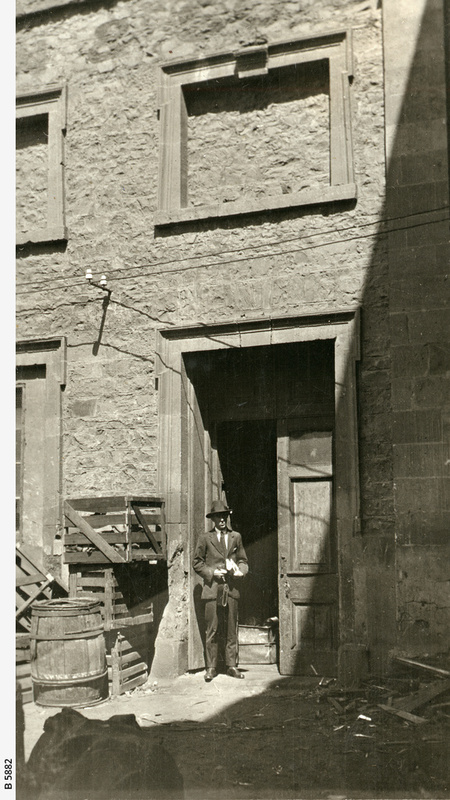 [General description] A man stands at an open side door of the old Congregational Church. There are wooden crates and a barrel nearby. This photograph would have been taken at the time when A. Simpson & Sons intended to demolish the building to expand their premises. Designed by George Strickland Kingston, the building was completed in November 1840. After the Stow Memorial Congregational Church was built in 1867, it was no longer used as a place of worship but was put to varying uses. [On back of photograph] 'Acre 205 / Gawler Place / Old Congregational Chapel / eastern front / 1923 / For exact site see B 1206'.